That's them removing their stock from the NASDAQ stock market, folks. 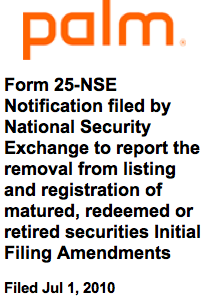 NASDAQ certified and signed the form, so everybody's in agreement here. If last night's welcome to the new era didn't drive home the fact that Palm is now part of HP, the fact that very soon you won't be able to buy their stock independently should, eh? Let's get it on, HP!